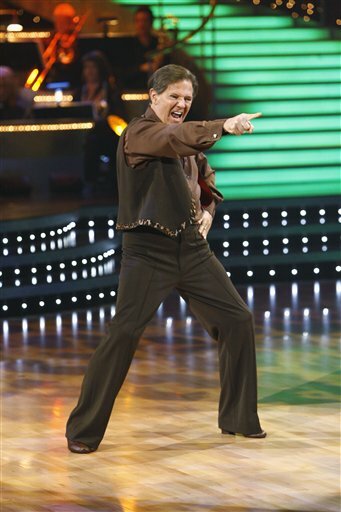 It wasn't two left feet, but two fractured feet that forced Tom DeLay to hang up his dancing shoes on Tuesday. The former House Republican Whip said he's taking his doctor's advice and leaving the ABC television show "Dancing With the Stars." DeLay has been diagnosed with stress fractures in both feet from the rigors of dancing and must wear foot braces when away from the ballroom. Doctors and producers urged the 62-year-old to withdraw from the dance-off. But he was determined to continue Monday, performing a sufficient samba with professional partner Cheryl Burke. "What's a little pain when you can party?" he asked before performing. But the pain proved too much Tuesday and DeLay said he couldn't continue on the hit reality show. "If you can't practice, you make a fool of yourself out here," he said. "And I don't want to do that to Cheryl." The former Texas congressman said his next dance would have been the Texas two-step. Show host Tom Bergeron invited DeLay to perform the dance on the season finale if his feet were up to it. "That'd be wonderful," said DeLay, still wearing his red-and-white performance outfit adorned with a Republican elephant. DeLay and Burke finished one point away from last place Monday, earning 15 points out of 30.